The Bunny has gone mobile! 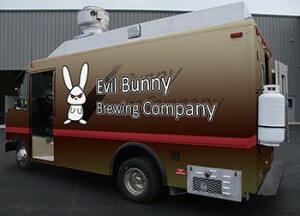 Look for Evil Bunny Brewing Company’s mobile tasting truck at the next festival you attend. Step right up for your favorite. This is the first in our (hopefully) fleet of fanciful tasting trucks that we envision will be touring the countryside, stopping at local pubs and festivals with flavorful flagons and fabulous freebies. The first ten NEW VISITORS will get a free hat emblazoned with the Evil Bunny “crossed carrots” coat of arms and get to be the coolest guys and gals at the festival, drinking a Run Away! Red Ale while protecting their heads from the scorching hot sun. Line up with the masses to get your very own. Check out our Calendar of Events to find out where our tasting truck will be every weekend. And come by to say hello!